Steve Kaos - me myself! Obviously I am present in all the characters, but I am of course available as my usual outgoing, interactive, friendly and jolly self! 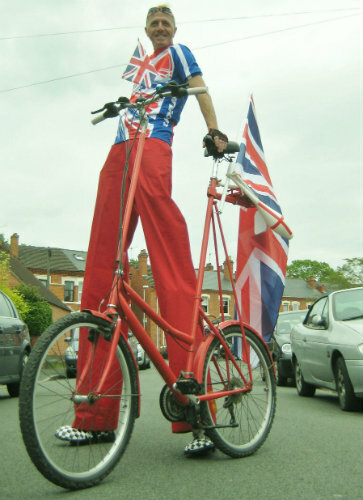 I have a number of finely tailored bespoke suits in an assortment of groovy colours, for ground based or jolly tall and with any of the bikes. 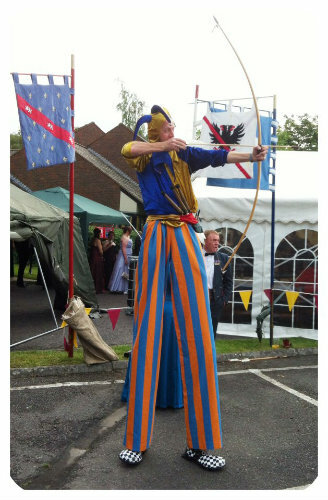 If you have a colour scheme for your event there is a very good chance of my being able to perform in a costume to match or complement it. 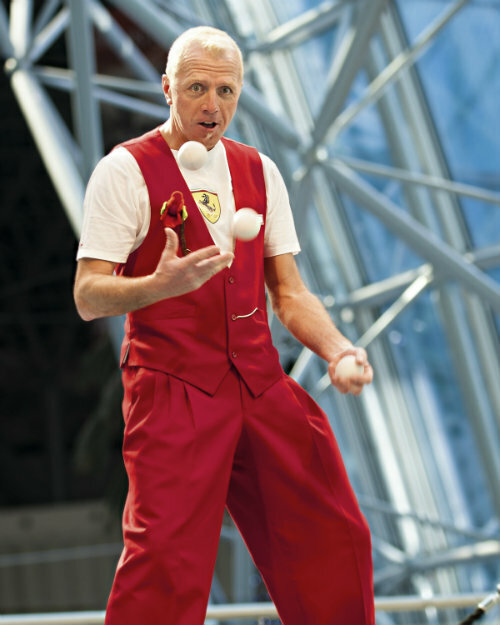 Walkabout entertainment is my speciality but also comedy juggling and diabolo shows, fabulous circus workshops, hosting and compering, TV, Film, double acts, triple acts and more. 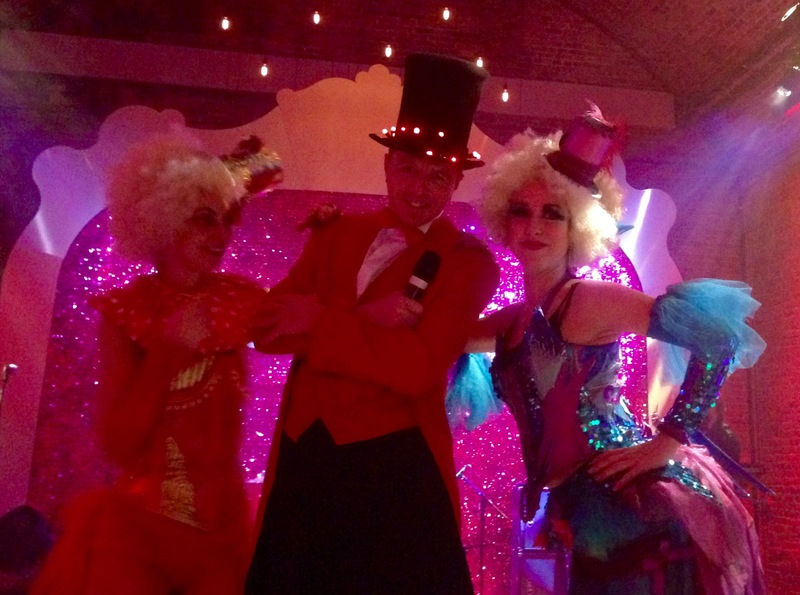 Ringmaster MC Compere Extraordinaire! 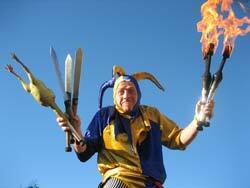 Just as it says, for cabaret shows, award ceremonies, music events, fetes, parties and more! 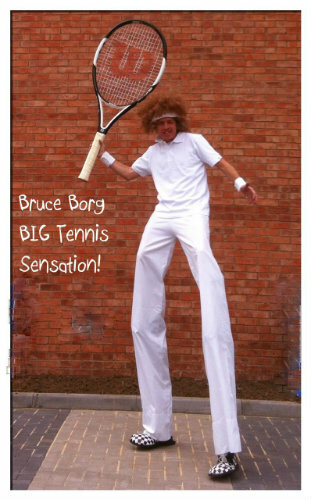 Bruce Borg - BIG Tennis Sensation. All the way from Upanover Down Under, standing just over 9 feet tall Bruce has a huge racket and enormous balls, always ready to serve up a compliment for the ladies and sporty banter for the blokes! Medieval Kaos. 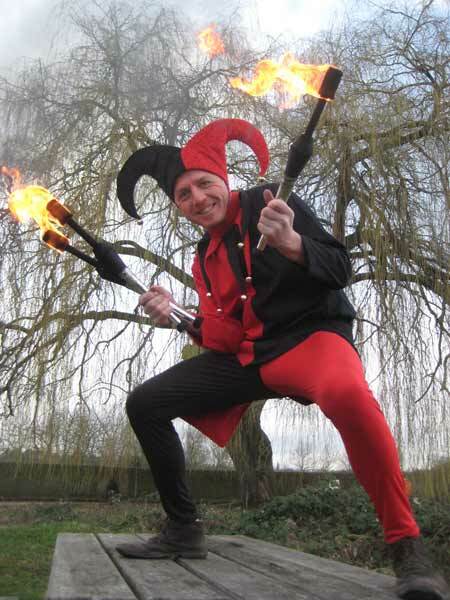 A very silly jolly juggling jester, as a stilt walker, bouncing stilt walker or on the ground with fire eating and juggling with fire, knives, rubber chickens and heaps of nonsense. P.C. Plodworthy junior (grounded). 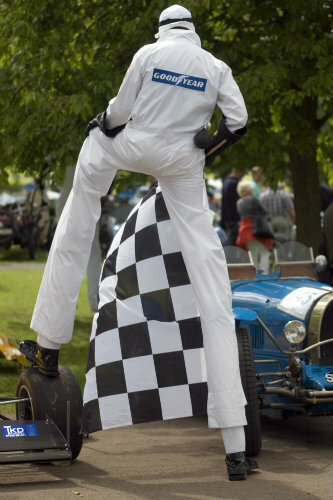 Twin brother (although somewhat shorter at 6 feet tall) of Plodworthy senior and always up to similar antics! 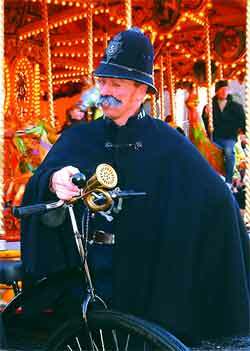 He is a member of the police farces flying squad riding his Penny Farthing. Senior and junior have been known to appear at the same event although one always seems to disappear when the other appears…. Dapper Chap. 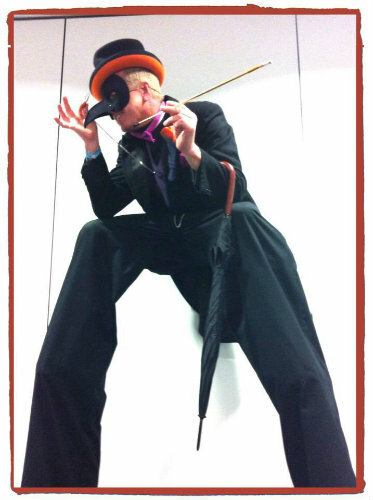 Impeccably turned out in top hat and tailcoat, In traditional Black or all Red, a true Victorian gentleman or splendid English tweed with fine juggling skills honed to perfection during forays to the Far East. 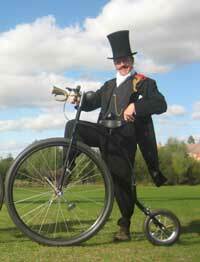 Available as a stilt character, stilt cyclist, ground character and penny-farthing rider, Splendid! 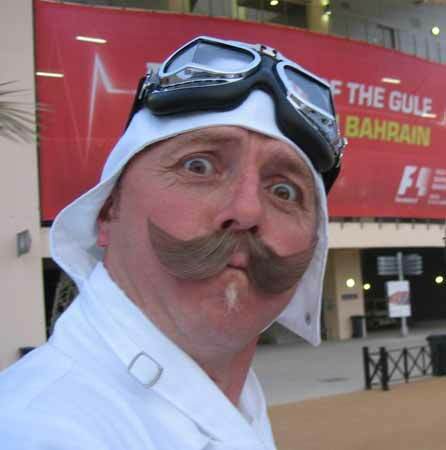 Reginald ‘Tick Tock Monty’ Montgomery Carruthers the Third. British and World Champion racing driver 1901-1941. Famous for a lap of 24 minutes at Silverstone (Even after stopping for tea and muffins). 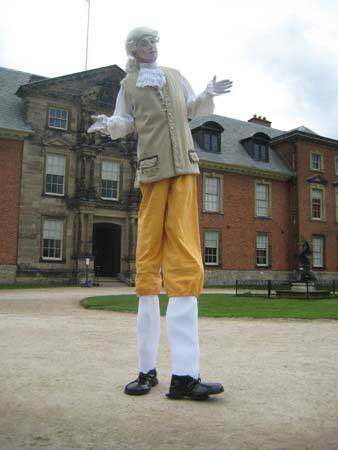 Standing over 9 feet tall and always complaining about the leg room, he always has a word of encouragement for the gents and a compliment for the ladies. 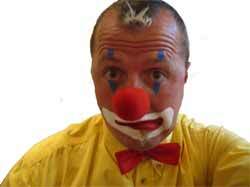 Raymond Boing. 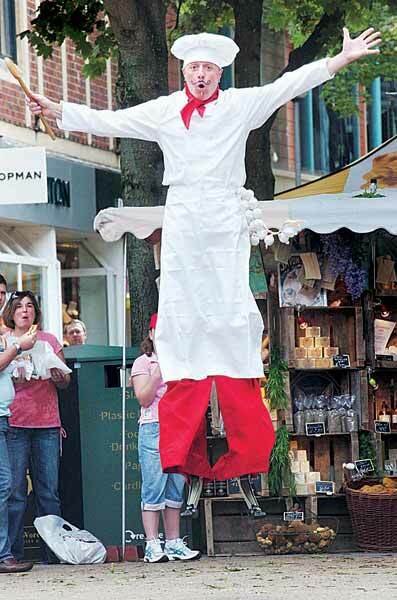 Bouncing chef extraordinaire! Medieval bouncing Kaos. Just as it says ...Gadzooks! Captain Kaos. 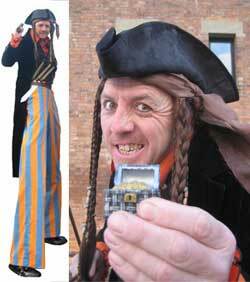 Pirate of the high seas and duck ponds… Swashbuckling fellow on the ground or on stilts with pirate jokes and banter plus tales of (very small) treasure! Mr Kaos. 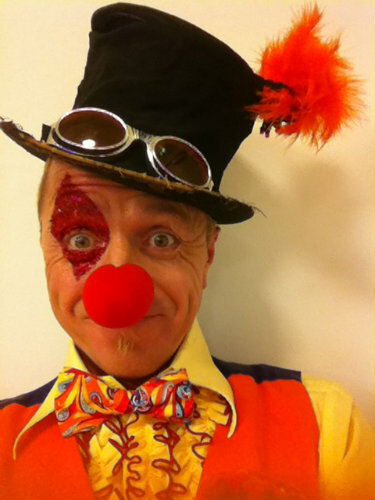 Clown, very clever with his juggling skills, jolly clever on stilts, Mr Kaos bicycle courier services on his incredibly tiny bicycle and very silly in all other ways… but not at all scary and keen to prove it by being a jolly nice chap with a big red nose! Lofty Sprint - British cycling champion. 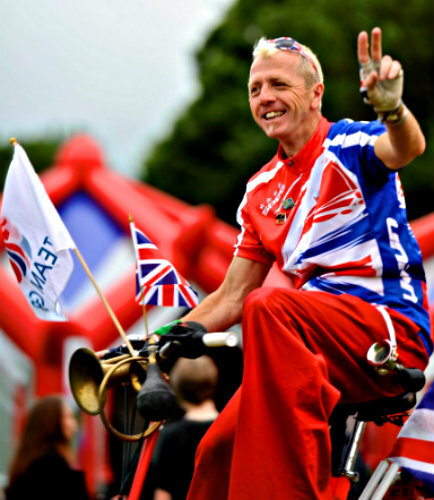 After great success in the 2012 UK Olympic torch relay, The Tour de France and other road races galore, lofty loves to ride his rather tall bicycle around sporting events, cycle races, parades and more, encouraging cyclists of all ages and telling pedestrians to get 'On yer bike mate'! 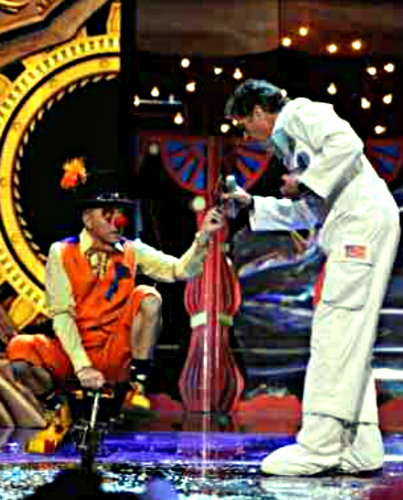 A rather tall Arab and The Joker. 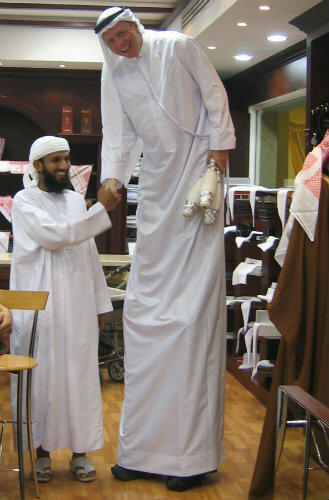 The rather tall Arab dishdash costume was created by a tailor in Dubai originally as a gift, and the Joker for a Batman event, the original Big arch villain!